I cleared out the fridge just now. All those vege and things that I used to cook for him. The spinach has wilted, the brocolli has turned yellow and potato turned black. Throw everything into the dustbin. Took out the fish fillets meant for him and make sweet and sour fish for myself. I added raspberry jam to the tomato ketchup to make this sweet and sour fish. Was suppose to be his meals. But then, he probably is somewhere out there, in a better place. At that time, hubby was out with his wife and CHILDREN to find the ideal resting place for him. They are looking for a columbarium to place his ashes. I cooked the bitter gourd that I had earlier intended to make bitter gourd soup for him. 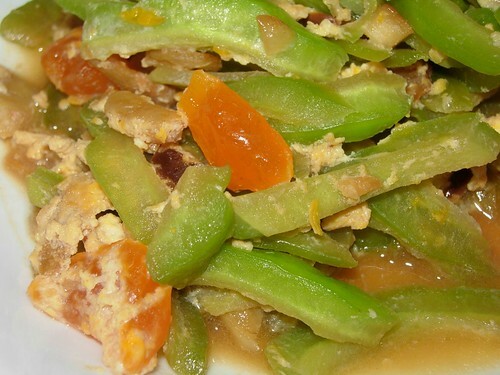 I stir fried the bitter gourd with dried shrimps, tau cheow and added one salted duck’s egg. Hubby then phoned me to get Ah Chuan the undertaker’s phone number. Eheh this woman has Ah Chuan’s phone number in her contact list. How morbid, can I get? Apparently, they had gone to four places where ashes can be interned but all the time, the family cannot find something they like. 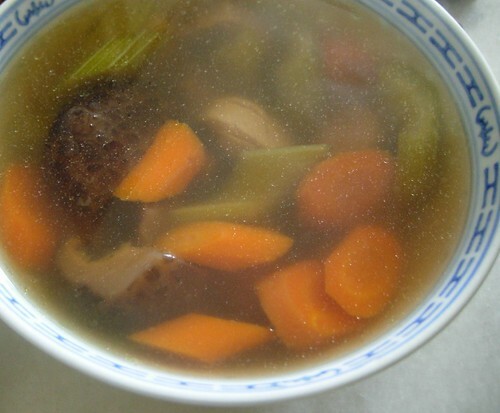 I boiled some soup with the celery and carrots I had in my fridge. Was his portion of vege too. After some time, they went to Kek Lok Si temple. Prices for a square where you keep the ashes costs between RM600 (in some dark places with no windows) to RM50K for those which sits on the hill and face the sea. The fengshui theory is, sit hill, see sea is good fengshui for the future generations. After I had prepared lunch for my children and eaten my own lunch, I had to rush out to College General for a meeting. While walking to my car, suddenly an idea or you can say a gentle prodding from somewhere told me something. So, now, the family has gone back to their home and they are going to ‘ask him’ and ‘puak puey’ (throw of coin to ask for divine intervention for an answer). Gee…..I wonder if I concentrate hard enough, I can get divine messages on what empat nombor ekor will come out this weekend? Anyway….it feels so good to be cooking a normal meal, eating it and be normal again. I think if things go the way it is supposed to go, I am going to be cooking for the Pope real soon. Hehehe. Not really but close enough. Say lah, my lunch looks good! And in case the kepochees want to know what is the other dish, it is pork with ginger, soya sauce and sesame oil. Non-halal mah, so I don’t put big big photo lorrr. ceh, your blog halal blog meh? can I go over to your house for dinner ah? Hungweeee…..LOL. Eh, “CHILDREN”…the unfiliel biyatch has returned issit? foong – Habis liao lorrr….Yes, CHILDREN. Thank God, finally, last night. I wasn’t there and I think I shouldn’t cos I have nothing good to say. Saves me from ‘I have so much to say but I cannot say it’ constipation. eXFoois last blog post..How to Get Rich? CHILDREN lah. So came back already lah? If you get the 4D number, email me hor. No need wait for weekend, 2moro Wed lah. Can whack 99. My stomach is growling Lilian. It sure do looks yummy. cys last blog post..Ae’s Baby. Don’t forget to buy nombor ekor of his death cert and hearse. u so jaga him during him last days for sure he will poh pi u.
i don’t know how but the foods scream penangite. Maybe it’s just that i know you are from penang. sighs. 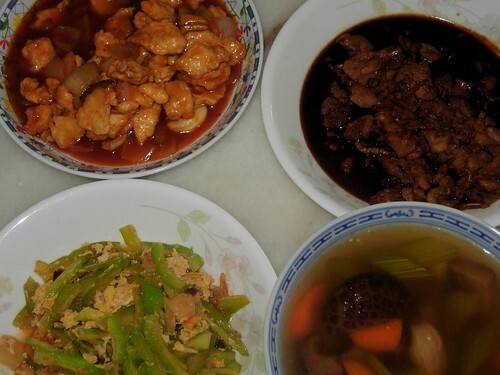 home sweet home i miss mum’s cooking. CJs last blog post..You’re A Failure? You’re Not Alone. 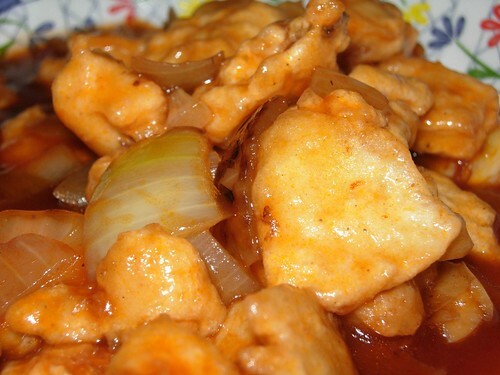 ur sweet and sour fish looks yum la… =P recipe ada?? Yum dinner. Yea, the square quite pricey lor. My uncle one (he was a Buddhist) oso around 10k leh. Some more damn far. Near snake temple there. The food looks good. But adding raspberry jam and egg yoke to the dishes does make it special. How long does it take for you to cook all these?